When thinking about holiday decorating, your mind probably goes to Christmas trees, wreaths, stockings and outdoor lights, amongst other things. So does ours! 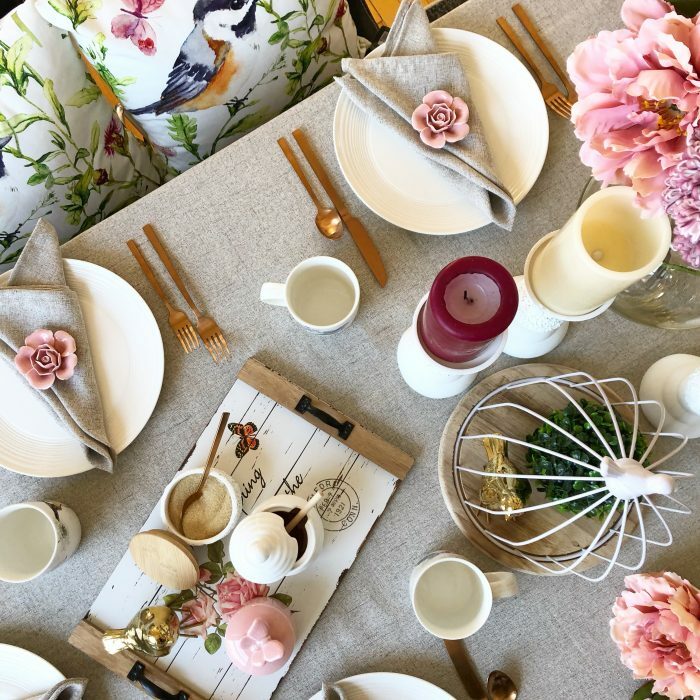 Though decorating your table setting just right might not make it to the top of your list of to-dos for “Operation: Deck The Halls,” you might just want to reconsider. We’re here to show you why setting a gloriously cheerful and inviting table can make all the difference at not only your biggest feast of the year, but any holiday experience you and your guests will never forget. You’ll be itching to set a table that outdoes any you’ve set in the past, and the best part? 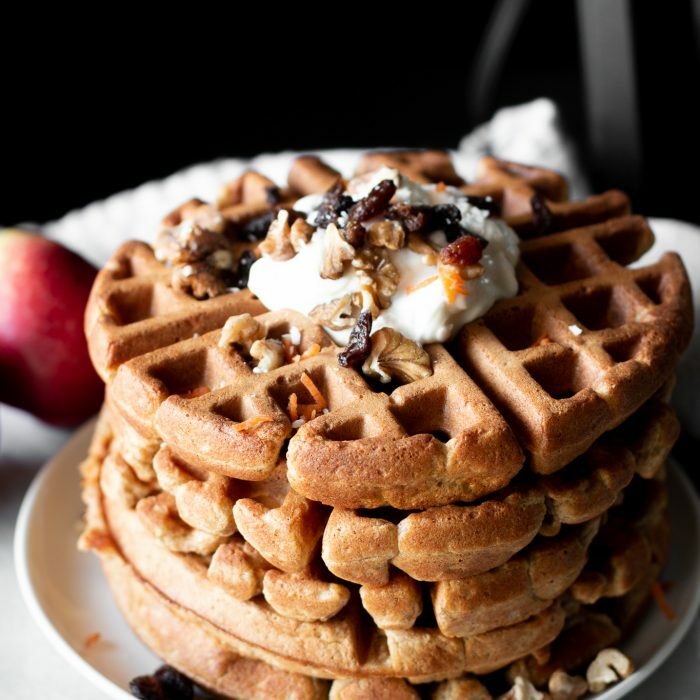 We have tons of ideas to give you a great start! Setting a cheerful, beautiful, and thoughtful tablescape is a great way to show your guests how pleased you are to be sharing the evening with them. 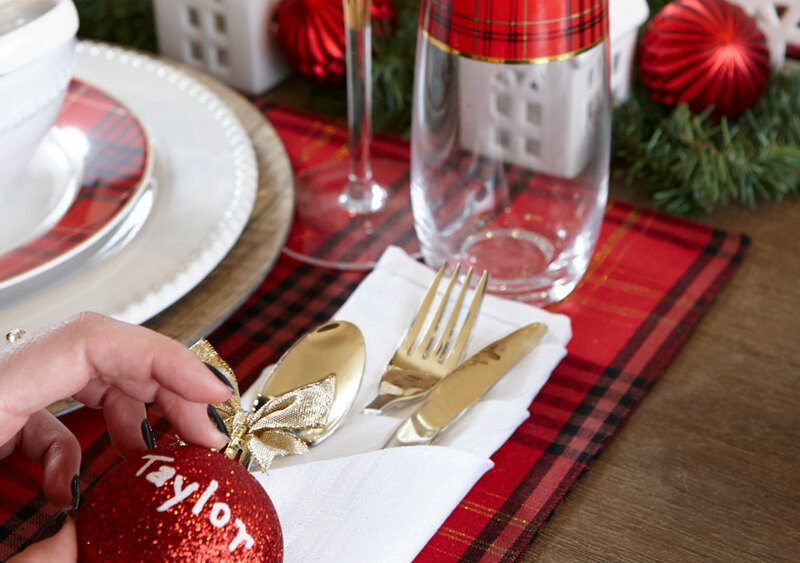 It can be a fun way to bring even more yuletide glitz and glam into your home (bring on the gold, plaid and all kinds of classic holiday bits and pieces!). 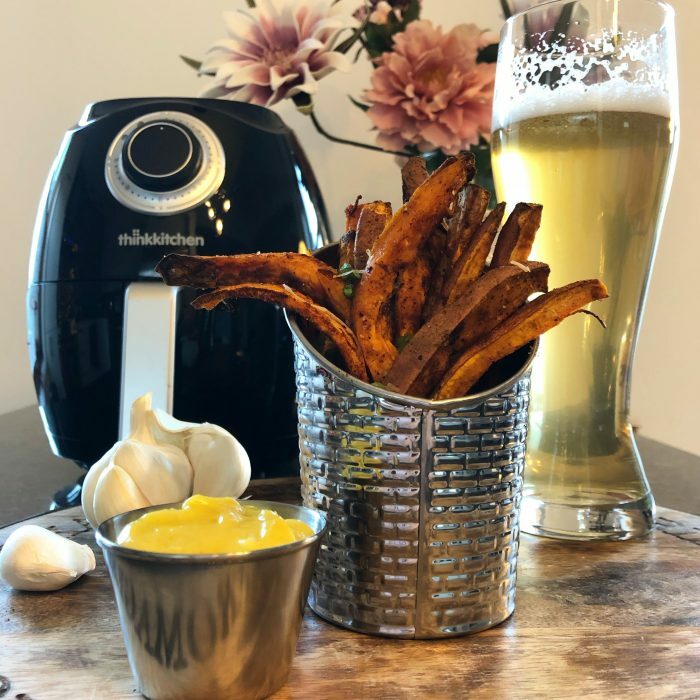 It also creates a first impression of the feast and can build anticipation for what’s to come: the best of tasty family traditions and show-stopping creations! Your table décor can set the tone for the entire meal: casual or formal, relaxing or upbeat. Above all, the goal of decorating a table should be to create a welcoming ambiance. 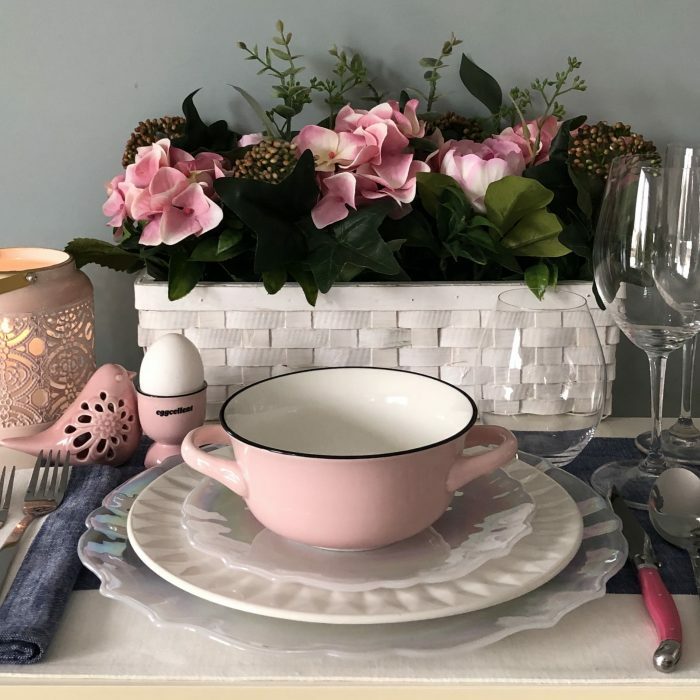 Whether it is a gift for your guest at each place setting or a name card to guide them to their place without hesitation, making them feel at home is a host’s purpose. So, this festive season, make dinning delightful with these merry and bright ideas for your holiday table décor! 1. 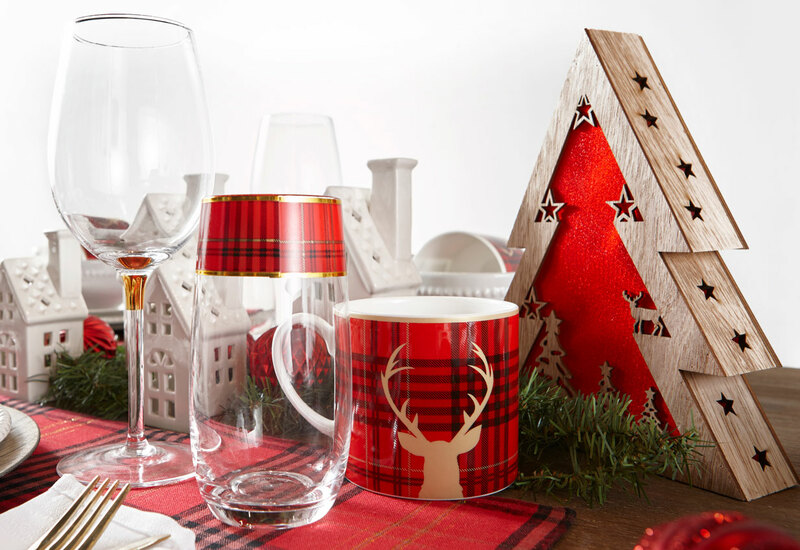 Holly Jolly Homes: A flicker of festive cheer is an important element of any table! A candle lit centerpiece is timeless and creates seasonal charm, while the contemporary design of our Scandi House Tealight Holders (available in-stores) keeps it modern. 2. Fanciful flatware: Having some fun and getting creative with elements on your table shows guests you put time and effort into setting the table for them. Creating a special holder out of your napkin with pockets for your cutlery, like we did with our Champagne Flatware Set and Nature Napkins, is a clever way of showing off some of your crafty talents! 3. 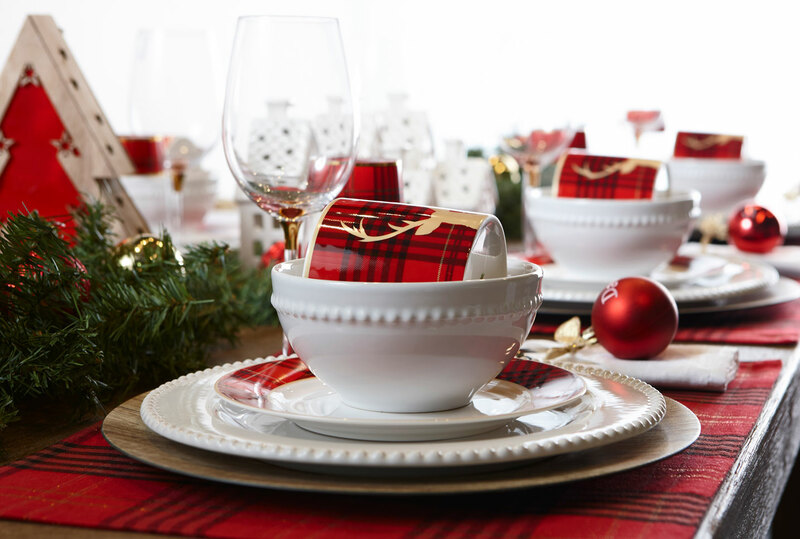 Plaid Pops: Bright red and just right for yuletide feasts, our plaid Christmas Eve open stock dishes pop against the subdued elegance of our White Pearl dinnerware set. The classic pattern will give your table an energetic feel. 4. Woodland Welcome: Evergreens are emblematic of wintery celebrations. 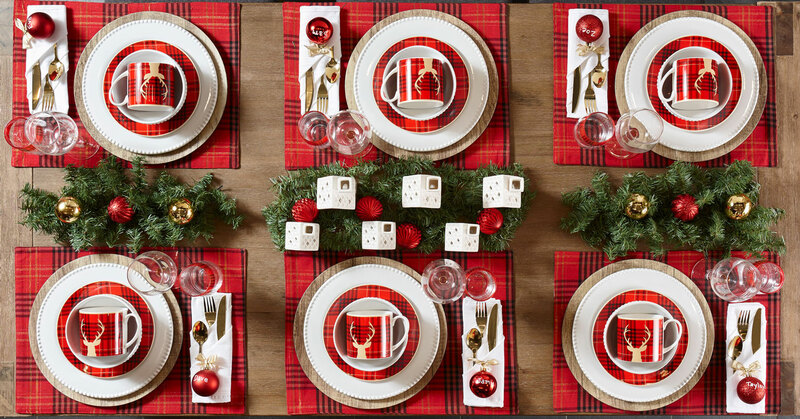 Trimmings of greenery are always a “do” for any holiday décor and add a rustic touch to contrast a Faux Wood Charger against a red plaid Comet Placemat. 5. Hello Deer! : What’s a Christmas table without a woodland creature? 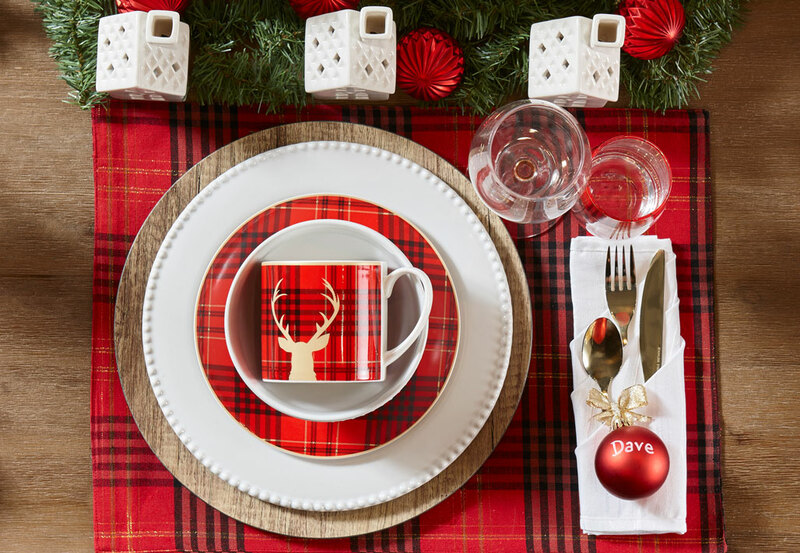 The deer motif on our Christmas Eve Mugs and Bowl add a lighthearted, but nevertheless wild factor to your tablescape. 6. Adorable Ornaments: Ornaments aren’t just for the tree and this time of year is for all things that glitter. 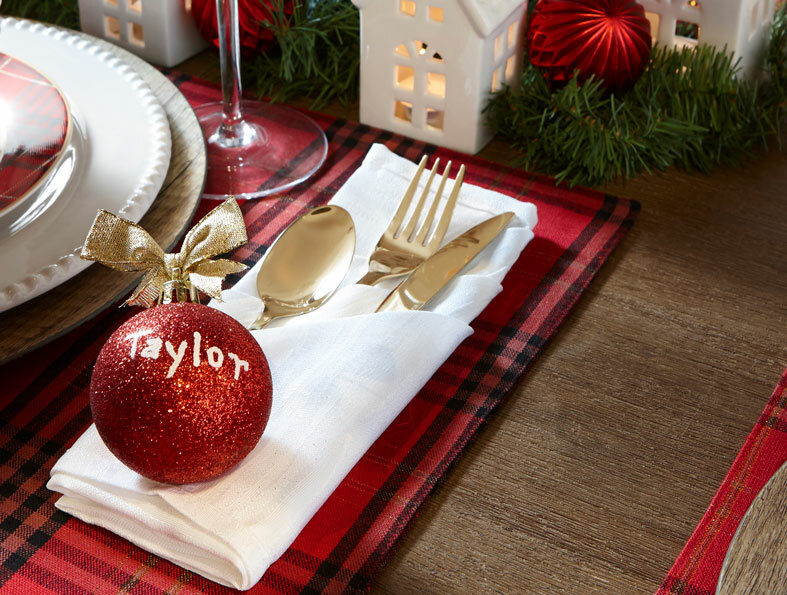 Personalizing each place setting with a name is charming and endearing. Guests will be glad to find their seats without hesitation. 7. 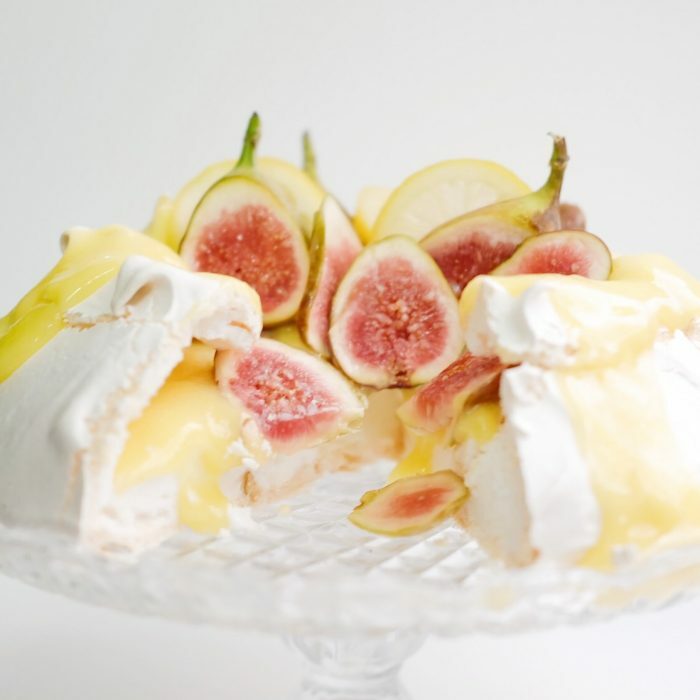 Gold is Good: It’s just so right to adorn your table in gold during this season of bliss. Our ornaments are topped with a bow that glitzes and glimmers. The cutlery set on the table adds another gilded element that shimmers off the table. 8. 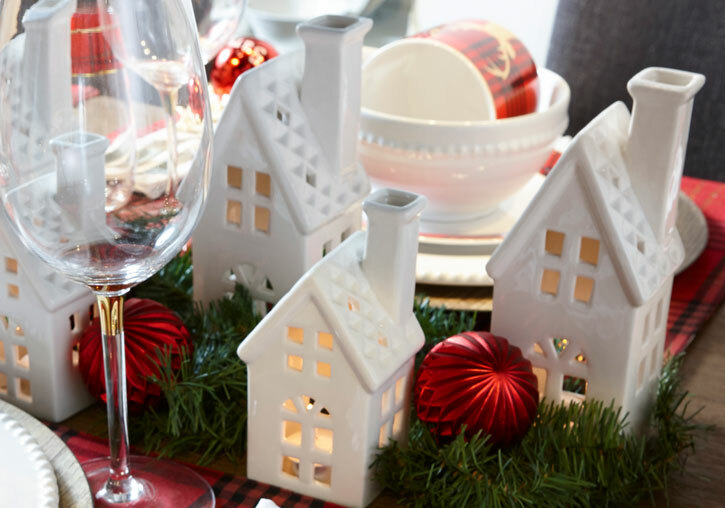 Fun and festive: With the Scandi House Tealight Holders (available in-stores), we created an enchanting Christmas cottage village for a playful look, yet a contemporary vibe. The ornaments on the greenery that make up the centerpiece will have you thinking of your tree and are an easy way to elevate your table. 9. Glittering Glassware: Often simple and understated, even your wine glasses can make a statement. The Oro Red Wine Glass is effortlessly elegant and has a touch of gold on the stem for a festive feature.